What a difference a big road victory can make! The Arkansas Razorbacks 90-89 upset of No. 19 LSU shined a new light on the Hogs’ season and what opportunities could await Mike Anderson’s squad down the road if they are to continue their hot streak. 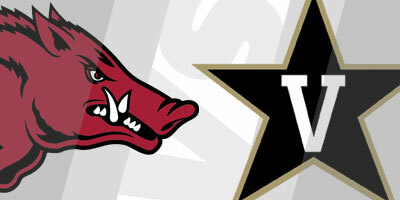 The Hogs (13-8, 4-4 SEC) have won their last three SEC games and are looking to make it a fourth at 8 p.m. when they host the Vanderbilt Commodores (9-12, 0-8 SEC) at Bud Walton Arena. The game will be televised by the SEC Network. Less than a week ago, the Hogs’ postseason chances seemed remote, and to be honest, they still aren’t great at the moment with the Razorbacks’ NET Ranking at 57. However, if Anderson’s squad is shaking off its inexperience and is seeing the game more clearly, there might be some hope for this squad squeaking into the NCAA Tournament. What we don’t know is if the LSU victory was an isolated incident, a fluke of a win brought on by an uncommonly hot shooting night — 58.3 percent from the field and 54.2 percent from the three-point arc — or if it was actual improvement that the Razorbacks can build upon moving forward. The Razorbacks, which are now at .500 in the SEC, will have to play better than .500 ball the rest of the way if they are to position themselves for an NCAA Tournament bid. With 10 regular-season SEC games to play, the Hogs would need to go at least 6-4 and probably more like 7-3 to be within striking distance of an NCAA bid going into the SEC Tournament, held March 13-17 at the Bridgestone Arena in Nashville. The Razorbacks would still have work to do in Music City, but if the Hogs are capable of going 6-4 or 7-3 over the next six weeks, it wouldn’t be out of the question of the Razorbacks winning one or more games in Nashville. All lumped together that seems like a task that might be too tough for Daniel Gafford and the rest of the Hogs, but Anderson has led other Razorbacks squads in similar situations to the postseason. The Razorbacks just need to take their schedule a game at a time and continue to improve. The Hogs aren’t going to average shooting nearly 60 percent from the field like they did in taming the Tigers, but they can continue to hustle and play stingy defense, while playing smarter and being more consistent on offense. However, if the Razorbacks are going to make it to the postseason, they have to rebound better as a unit and they need to take care of the basketball better. After the Hogs took an 18-point lead thanks to a barrage of three-pointers, LSU crawled back into the game by pressing the Hogs. Arkansas had 18 turnovers in the game, which nearly negated the 21 they forced. More than a few of those turnovers came off lazy passes where the Razorbacks underestimated the athletic ability of the Tigers. Nonchalant passing and failing to be strong with the ball has been an issue this season. It’s one the Razorbacks need to get over if they plan to be a postseason team. Though happy enough to dance with his Hogs in the locker room following the victory which sophomore guard Mason Jones sealed by a smart and clutch drive to the basket, Anderson lamented the Razorbacks’ effort on the glass against the Tigers. “We’ve got to do better of keeping teams off the offensive glass,” Anderson said. “They had 19 offensive rebounds. They missed a lot of shots, which creates more opportunities, but defense ends with rebounding the basketball. “Our guards have to do a better job of rebounding. They can’t go through the game with just one rebound. We’ve got to do a better job on the glass, going forward. Anderson said that when coaching a young team, it’s not uncommon that when you correct one area of play another opens up, but he added that his team has seen enough and played enough together to get over those issues. At times the Hogs have done a very good job taking care of the basketball, but at other times, their ball-handling has been sloppy and careless. 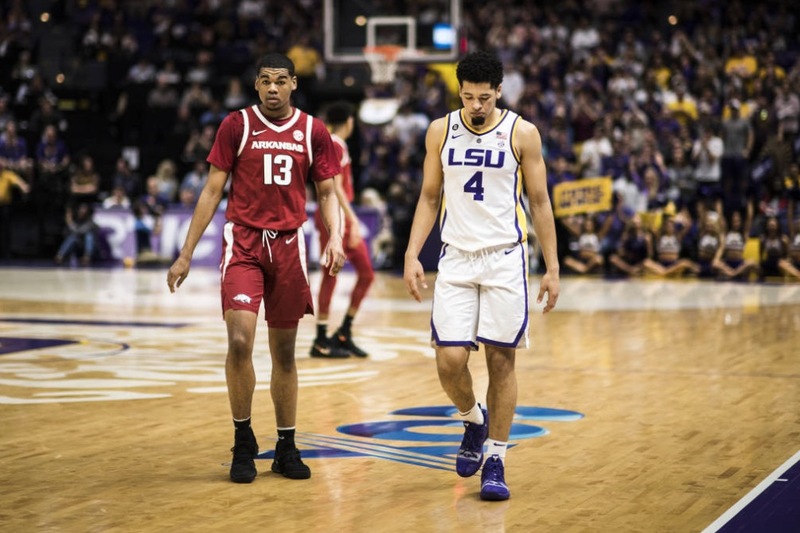 Not every team has the athletic ability to press as effectively as LSU did in the second half, but with the problems Arkansas had, the Razorbacks can expect to be pressed more the rest of this season, particularly against long, athletic teams like Alabama and Kentucky. However, Anderson was proud of his team’s effort at LSU and was glad they finished the victory off. As for his getting dowsed with water as he entered the locker room and his performance of the Shoot Dance, Anderson said it was just him having fun with his team. Though Vanderbilt hasn’t won a SEC game this season and is on a nine-game losing streak, the Commodores are still capable. They proved that by taking No. 1 Tennessee to the limit at Nashville on Jan. 23 before falling 88-83 in overtime.